Tuberculosis can inflict catastrophic consequences on the most vulnerable in society. When it comes to the drug-resistant forms of tuberculosis (DR-TB) the difficulties in completing long and toxic regimens for DR-TB, the cost of the treatment and loss of income can have a devastating impact on the patients and their families. KNCV Tuberculosis Foundation supports countries to reduce the physical, psycho-social and economic consequences that treatment of DR-TB can have on a patient’s life. Our solutions are patient-oriented and driven by new technologies such as rapid molecular diagnostics and new (combinations of) drugs. 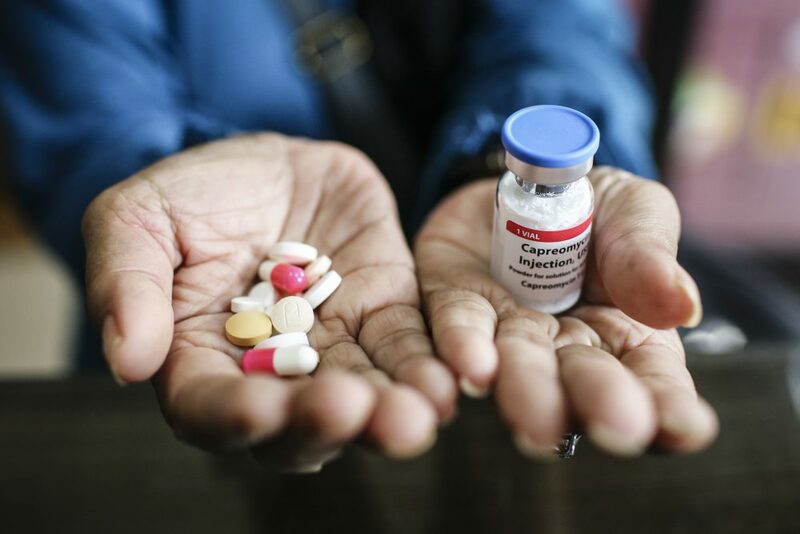 New drugs (bedaquiline and delamanid) and shorter treatment regimens for DR-TB provide new hope to half a million DR-TB patients arising each year. Treatment can be as short as nine months, and will offer a higher chance of cure compared with other approaches. Applying the “right diagnosis, right treatment” principle requires early and correct “patient triage” allowing for rapid determination of the best treatment for all TB patients. 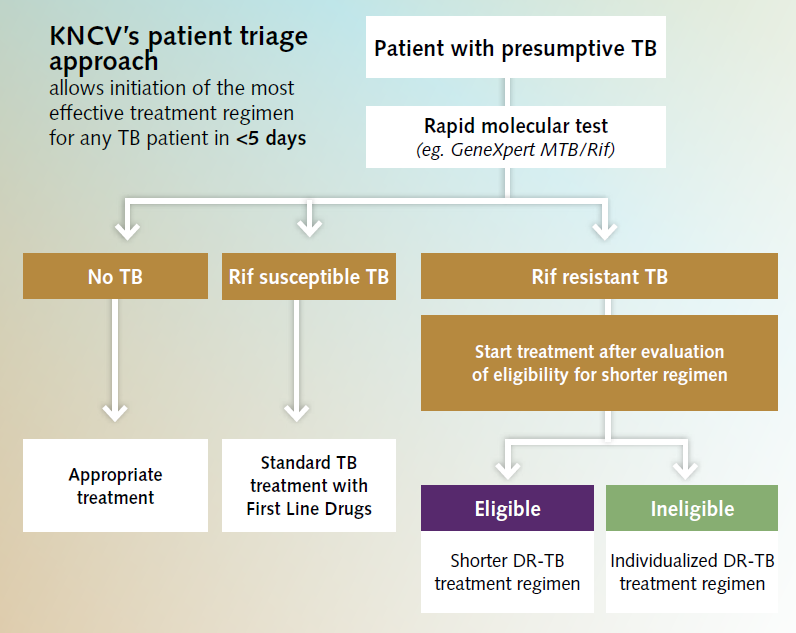 The KNCV Patient Triage concept refers to the process of early diagnosis and determining the most appropriate treatment for patients with DR-TB. allows for initiation of the most effective treatment regimen for any TB patient within a week. utilizes the latest rapid and more accurate molecular based diagnostic to identify DR-TB strains and determine eligibility for the shorter treatment regimen or a regimen tailored to their needs. leads to DR-TB patients being offered the least toxic, shortest drug regimens. Four year-old Ilias and his two year-old sister Sumaya were diagnosed with DR-TB in February 2017. Under the umbrella of the KNCV-led USAID-funded Challenge TB project in Kyrgyzstan, they were selected to be among the first 62 patients to be enrolled in a new project that treated the patients with new drugs and regimens for DR-TB. Their treatment takes nine months instead of the 20–24 months of the usual longer treatment regimens. Ilias and Sumaya successfully completed the first part of their treatment and have gone home to continue their care there and be reunited with their mother and family. A heart-warming moment for all involved. It shows the potential for the introduction and implementation of new and more effective diagnostic and treatment tools. TB Drug-resistance: a rising global concern.